Bach: Sei Solo ( 2017). Mats Bergström (guitar). 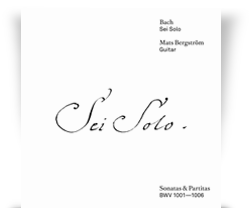 The Sonatas and Partitas for solo violin, BWV 1001 – 1006, by Johann Sebastian Bach, arranged for guitar. Recorded by Lars Nilsson at Nilento Studio. Cover by Henrik Eriksen. 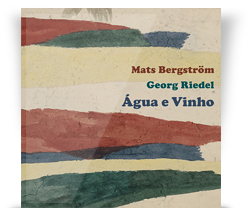 Mats Bergström Musik AB, MBCD 05, Double CD, Naxos distribution. Nominated for a Swedish GRAMMIS award 2018. View track info page in browser or Download press kit. Mats Bergström (guitar), Georg Riedel (double bass), Jonas Holgersson (drums), Sebastian Notini (percussion), Magnus Lindgren (flute), Fredrik Jonsson (electric bass guitar) & Andreas Hellkvist (organ). Music by Baden Powell, Heitor Villa-Lobos, Egberto Gismonti, Vinícius de Moraes, Antônio Carlos Jobim, Chico Buarque, Luiz Bonfá, Edu Lobo, João Gilberto and Eliane Alias. Recorded by Janne Hansson at Atlantis Studio. Cover by Jockum Nordström. Mats Bergström Musik AB, MBCD 04, Naxos distribution. Svante Henryson (double bass & cello), Mats Bergström (guitar) & Magnus Persson (drums & percussion). 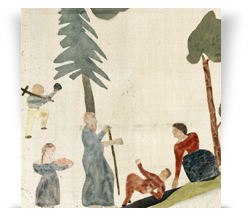 Music by Svante Henryson, Anders Hillborg, Mats Bergström and Svante Henryson/Erik Weissglas. Recorded by Lars Nilsson at Nilento Studio. Cover by Jockum Nordström. Mats Bergström Musik AB, MBCD 03, Naxos distribution. Nominated for a Swedish GRAMMIS award 2016. A couple of Swedish contemporary classics and a bunch of future ones? 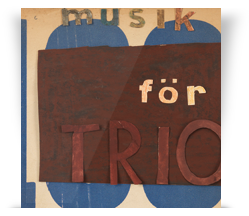 Previously unpublished guitar works of songwriter legend Olle Adolphson and music from a beloved motion picture? Well, these are some of the features of this CD/BD. A bonus track, with live electronics in the form of two massage balls, has got a video by Simon Larsson. Other visual material is the work of artist Jockum Nordström and photographer Per-Erik Adamsson. Performers: Mats Bergström (guitar) and a string ensemble under Björn Hallman (track 19). Music by Björn Hallman, Anders Hillborg, Anders Nilsson, Andre Chini, Johan Berke, Anna Cederberg-Orreteg, Hans Gefors, Thomas Jennefelt, Ida Lunden, Christofer Elgh, Rolf Martinsson, Olle Adolphson, Anna Eriksson, Mikael Edlund and Ludd. Two remixes by Cornelia. Box containing a CD as well as a Blu-ray Disc, the latter with high-resolution (24/96) sound recorded by Lars Nilsson. Mats Bergström Musik AB, MBCDBD 02, Naxos distribution. Mats Bergström and Johan Liljedahl (electric and acoustic guitars), Svante Henryson (electric bass guitar), Jonas Östholm (piano), Magnus Persson (drums and mallet instruments) and Edda Magnason (piano and vocals). Music by Steve Reich and Edda Magnason. Mats Bergström Musik AB MBCDBD 01. Box containing a CD as well as a Blu-ray Disc. The Blu-ray has got high-resolution (24/96) sound recorded by Lars Nilsson and video art by Simon Larsson. 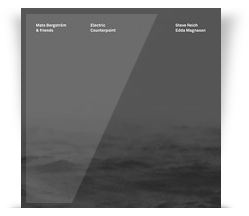 Mats Bergström Musik AB, MBCDBD 01, Naxos distribution.